Vlad – The Last Confession | AUTHOR. ACTOR. SWORDSMAN. DRACULA. A name of horror, depravity and the darkest sensuality. Yet the real Dracula was just as alluring, just as terrifying, his tale not one of a monster but of a man… and a contradiction. For the one they called ‘The Devil’s Son’ was both tyrant and lawgiver, crusader and mass slaughterer, torturer and hero, lover and murderer. His tale is told by those who knew him best. The only woman he ever loved and who he has to… sacrifice. His closest comrade… and traitor. And his priest, betraying the secrets of the confessional to reveal the mind of the man history would forever remember as Tepes – ‘The Impaler’. But Vlad’s actions defy such labels. Like the comet that scorched Wallachian skies the summer he took and held his father’s throne, his extraordinary life burns with passion, taking him from his years as hostage to the Turk, through torture, battle, triumph and betrayal, ultimately to a last crusade – and there perhaps, beneath the twin banners of the Dragon and the Cross, to find redemption for his… innumerable sins. 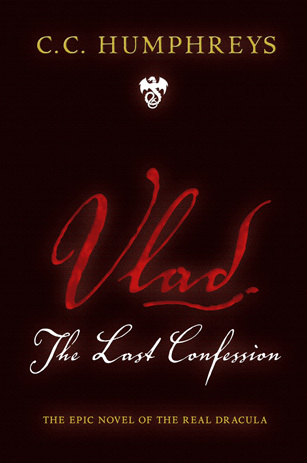 VLAD: THE LAST CONFESSION spins legend and facts and together into a monumental novel of blood, love and terror. This is the true story of Dracula … as it has never been told before. Here’s a podcast I made while all alone in Dracula’s castle! Visit the photos in Vlad’s Gallery. ‘ “Vlad” is … an accessible, fast-paced, narrative-driven, damn-near-irresistible historical thriller. Humphreys’s research infuses every page, but never calls attention to itself; the story always has centre stage. It’s the consummate “good read” for a winter weekend, pulpy and engrossing and just gross enough to satisfy that monster craving.’ Robert Wiersma, Globe and Mail, Canada. ‘Literate elegant writing… Vlad: The Last Confession superbly portrays the passions which drove Vlad, taking the reader on a whirlwind ride through torture, battle and despair. It’s a dark tale, but Humphreys illuminates it with historical details and page-turning bravura prose.’ Yorkshire Evening Post. “A fast paced, intriguing and beautifully constructed thriller.” Daily Express, UK. “A creepy masterpiece” BEST magazine, UK. ‘Cracking historical fiction with a humanised Count who utilised the greatest weapon in his arsenal against an invader and a book that is a must have for all fans of the genre.’ Gareth Wilson, Falcata Times. ‘Humphreys’ elegant prose and command of his obscure subject matter creates an uncompromising, extraordinary journey into the brutal times and tortured soul of an oft misunderstood ruler.’ C.W Gortner, Historical Novels Review. An unexpectedly riveting read.” Total Sci-Fi. I have both read, and listened to the audio version of this book…I LOVE it. Thank you for your engaging writing style, your work in researching a poorly understood historical figure, and you ability to humanize a character who has long been de-humanized. I appreciate your confession on the audio book in struggling to humanize this person. You do a wonderful job capturing the context of Vlad’s life, allowing your readers to make their own interpretations based on the story you tell. Can’t wait to read your other books, and I’m glad I discovered your wonderful writing style, which makes it easy for the reader to imagine being in all the places you describe. Thanks for all your work, you are an entertaining writer, and you work hard to provide your readers with context, beauty, fear, and humanity in a profound life changing way. Oh, Meaghan, what a lovely comment! Thanks so much. He is one of my favourite characters and I think I did succeed in conveying some of his complexity. You may like ‘A Place Called Armageddon’ – out in the States next month, though I don’t know where you are – some crossover characters – Mehmet, Hamza – and some complex new ones. All the best. Quick note; loved the book, great read and tale! First of your books read, will read more. Mike. A very good book. Despite the fact that I knew Vlad’s story from school’s history lessons, I was captivated by the suspense of book, and I kept reading till the midnight. You described very well Valachia,it’s people and customs,so I thought you were Romanian with an English pen name. Thanks, Teo – that’s one of the nicest compliments I’ve had. So glad you enjoyed it. For me Vlad was some sort of Impulse buy as I saw it in a book store in Vienna when I was actually looking for other books. It kind of caught my attention and I purchased the book, which I didn’t regret later on! It’s really intensely written and the characters are well-drawn. I devoured the book in less than two days. I loved Bram Stoker’s Dracula, but it was also nice and interesting to read more of the actual historic figure that Vlad was. Thanks, Dom. Great to have made a sale in Vienna and so glad you enjoyed it. You might like ‘Armageddon’ too. Some crossover, different type of story. I have always being fascinated by Dracula and a bit also in the real character, but since I read your book, I think I became more interested in the historic Vlad. I found the book fascinating, it’s very clear that you had to made an extensive research for it and yet you don’t give a history class, but a magnificent novel that keeps you interested in every single page. I love the way you took such a complex character as Vlad and showed us the real man behind Dracula’s legend. Vlad, has become one of my favourite historic novels. Thank you so much, Lai-Sing. I am thrilled that you so obviously ‘got’ the book. I am very proud of it. I’m a high school student, a future history major, and he is one of my favorite historical figures. I’ve done years of research on him as a person, but everything (as you probably are aware) is drenched in sensationalism about his cruelty. This was without a doubt a breath of fresh air–you showed both the cruel side and the loving, human side of him that I have been craving–CRAVING–for years upon years. Eliza, thanks so much for this. I love to hear of my novels making an impact, and perhaps filling a need. Vlad was one of the most difficult characters to write – to show him as a rounded person, neither a monster nor a pure hero. Comments like yours make me think that maybe I succeeded. All the best with your studies, present and future. Hurrah for History! In my mind, even before I read your work, Vlad was always a powerful leader who knew how to get things done–he used cruel ways, obviously, but all in all, what he did gave the results he looked for. He was firm. I wish more leaders (to be honest with you) had that backbone. You did a wonderful job showing that, in my mind. He was not a hero, as you said, but not nearly a monster. Oh, yes. Hurrah for History. My uncle gave me this book about a year ago. It is one of my all time favorites! Even my best friend (who almost NEVER reads) has thourouhhly! Great to hear Dylan. Love to get non readers reading. You guys might like French Executioner – wild, funny and bloody! I am from Transylvania, Romania, and I can’t wait to get my hands on this intriguing, breath-taking and exciting book! I promise I will return to leave a comment once I’ve read it thoroughly! Thank you Mr. C.C. Humphreys for making this possible! So pleased you are going to read it. I did have a Wallachian tell me he thought I had to be a countryman with a pen name. Hope a Transylvanian feels the same. Let me know when you finish. this summer i was down at the Gower in Wales with my family, time well spent being as i had finished my first year at university and i was currently trapped in the clutches of writers block. however after the first week I had read both the books i brought with me, coupled with the fact my brothers had been doing crosswords in my note books and i ran out of space to write, i was feeling a little on edge. my dad perchance on this book in a book store and brought it for me. ever since i was young i was enthralled with vampire lore mostly because i was afraid of them) as i began reading i was quickly fascinated with the world you created and the history you presented, because while i knew plenty about Dracula i knew almost nothing about the real vlad. i greatly enjoyed it, the characters were strong, the dilemma’s harsh and the world violent and while Dracula deeds were dark i was interested by the valid reasons that influenced his choices. i greatly enjoyed this book, it has helped influence my own writing and i hope that when i get my own work published that it will be as strong as this novel. needless to say, i will be diligently searching for more novels of yours. Delighted to have been an influence for the good and that you enjoyed the book. Good place to read it too- I love the Gower. Seems a long way from Western Canada though! New one coming in two weeks you may enjoy. Mr. Humphreys: I hope Timea (up there) won’t mind me mentioning that I owe a lot of my love for genuine Transylvanian history to her, and my favor in return was to recommend “The Last Confession” as one of the best historical novels I’ve ever read. That might say it all, but I also want to add that near the end of the book, I got practically breathless waiting to see how you would handle the ending. And “how” you handled it was superb! The only other thing I’ll add is that history is just what it is, which is very often as interesting or more interesting than the most creative fiction. But your book blended both history and fiction into a masterpiece of literature. I hope that indeed says it all. Buenos dias, realmente eres un excelente escritor, siempre me a gustado el personaje representativo del vampiro, pero este toque majistral de narrativa bajo un contexto hace de tu trabajo en vlad una pieza unica, la historia te premiara, ante el hecho del libro, has pensado en continuar, digo, estoy esperando que develes lo que realmente paso con el hijo de vlad. gracias. Hola, Jorge! Muchas gracias for todas sus palabras. Quizas un otra libro con el hijo una vez! Lo siento. Me ha olivado tambien de mi espanol! This was a complete accidental purchase. I love Vlad, he is also a favorite historical figure of mine, along with Elizabeth Bathory. I was in Save On Foods just getting groceries and it was laying atop the bin of books they wanted to get rid of. I found it and instantly bought it. One of the best finds in my life (book category of course lol). The way you wrote Vlad was captivating. He is a man now to me, not just a figure. You’ve improved my view of him so much. I truly believe now that this is what he was like. It seems such a perfect fit with him. You did succeed. And you excelled. Please keep writing. Perhaps even consider writing another of Countess Bathory? That would make a very good read also! That’s great, Andrea – aside from the bargain bin. Sigh! How do they expect an author to make a living? Hopefully you’re hooked now and will pop into a bookstore next. My new one’s out: ‘Shakespeare’s Rebel’. Vlad is/was fascinating. One of my faves. The way you bring together history and fiction is fascinating! It is sad in some way that most people know Dracula only as a fictional character – vampire and don’t know anything about real one. Vlad is now one of my most favourite books! Thanks, Anna, so pleased you liked it. You speak beautiful English, did you read it in English or is nit out in Russian? Glad you liked the ending too. Fun eh? Thank you very much ! Yes, it is out in Russian, but I read it in English) My sister bought it long before it was published in Russian. She is great fan of your books and recommended me to read Vlad. I have already read French Executioner and Jack Absolute before, but Vlad became the most beloved one! I thought I recognized the name ‘Sibul’. I have a vision of a young lady with a horse. Am I right? Where in Russia do you live? Sorry about Bran – Disney-dracula I called it. We are from Ukraine but now finished university and live in Moscow. I’ll admit, I was expecting more vampires and less history, but the writing style and the story pulled me in the way no story about Vlad has before. I absolutely loved it, it shed a new light onto the historical person I’ve read about but never have I seen him presented as a human being. Well, thanks! The vampires have had it their way too long. My favorite novel! Hope some day this could be a movie. I love history, and have always been fascinated with the real Vlad. Well, just finished reading. Great reading! And going to choose one of your other works. Hope to be satisfied. Thank you for feelings in me i have now. I found this book by accident but I must say that I love it. This is a great story and hard to put down. I plan to read the Jack Absolute series next and I am looking forward to it. Vlad is hard to put down and the best story I have read about him. You are correct, the vampires, (although I like the stories) have had their way too long. Thanks for a great read–I don’t know how you can top it but if you want to write more on Vlad, please do so. Thanks again! One of my favourite books! I am an English teacher and have suggested this book as a favourite for independent study in class. All who read it say the same! Great book which fills the void of the real Vlad Tepesh. A romantic thriller filled with great characters and descriptions. I could not put it down… literally! Thanks so much, I’m very proud of the book. Where do you teach? Love to hear of people studying my stuff! This is one of the best book I have ever read. I have finished it in one breath( very surprising ending- but who knows. :-)) I am very interested in this historical person (have read many books about him – documents)and when I got this book to my hands. And the result? Finished it twice:-) and it is a treasure of my library. I Wish it could be seen on silver screen in the future . Screenplay : C. C. Humphreys . Milan, so delighted by your comments. It makes my day as an author when I get this sort of feedback. I am very proud of that book. Thanks! I am a high school student and he is by far one of my favorite historical figures. I’ve done years of research on him as a person, but everything is utterly drenched in aggrandizement about his cruel deeds. I’ve read some novels based on the man and they to solely focus on the pathology of Vlad the iii instead of the character. I don’t know how you did it (and how hard it must have been) but you presented a human being who ultimately defied the simple labels of a “psychopath” and a “hero.” I actuality felt that this had to be the “true” Vlad the iii instead of the sensationalistic one the general public is familiar with. I just couldn’t believe the sheer brilliance in your writing prose that made me unable to put it down. I must admit, however, I was very…perplexed by the exact nature of Vlad’s relationship with the complex character of Hamza Bey. But besides that, a wonderful read that I know I will never forget. Thanks, Hailey. So glad you enjoyed my ‘take’ on him. I wrote it ten years ago, but Vlad still haunts me. Hardest thing I ever wrote, certainly – so dark – but I felt very proud by the end of the journey. Without forgiving, I think I gave him justice. Hamza and Vlad? Strange indeed. The key is the betrayal – the scene with the hashish. But I am sure you knew that. If you want to learn more of Hamza, read my novel ‘A Place Called Armageddon’. Where are you at high school? Always like to know where my readers are. All best and thanks for the comments.